"Mark Chamberlain and the Whiskey Poet Society was formed in 2012 with musicians from a variety of styles that produce music that is energetic, patriotic and powerful. They use a mix of red dirt, outlaw country and southern rock influences to provide a sound that is their own. 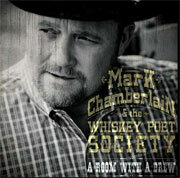 Mark Chamberlain and Whiskey Poet Society is a top of the line five piece band. Members include a former Kansas State fiddling champion, Ricky Yeubanks, and the steel/lead guitar, Dennis Blackburn, who was a band leader for Barbara Fairchild. The drummer is Brandi Chamberlain and on bass guitar, Rick Alumbaugh who brings his talent and experience from the Joplin and Kansas City area with various well known bands. Mark Chamberlain contributes to the music with strong and solid vocals and has recorded in Nashville. The bands debut album released in 2013. The Whiskey Poet Society is YOUR country dance band!"